Vogue Arabia’s recent issue for July/August 2018 is all about revolutionizing the perception of bodies. The acclaimed magazine features two cover stars, Ashley Graham and Paloma Elsesser, who are role models that embody this spirit of positivity and loving yourself. 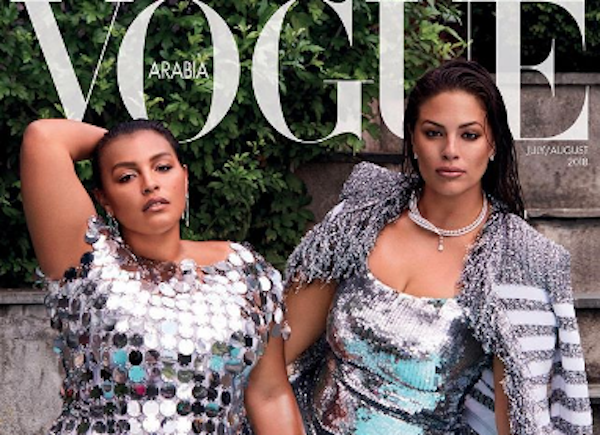 The two models appeared on a total of three editions for the Dubai-based fashion magazine, as they aim towards greater inclusivity of people of all shapes and sizes. All the covers were shot by photographer Miguel Riveriego, with two individual photos of the two models and another of both of them in a joint shot. This edition is the third feature on Vogue for Ashley Graham, having made history as the first ever plus-size model to appear on the cover of Vogue in the USA, on March 2017—albeit in a group shot. She has also been featured in her own individual cover on Vogue’s British Edition in January 2017. This would represent Elsesser’s sophomore feature on the cover of the magazine, after appearing in a May 2018 issue in British Vogue—as a tribute to a group of individuals who are revolutionizing the face of fashion. Each individual shot features a closeup of the two models floating in a swimming pool, adorned with smokey makeup, dewy skin, chunky earrings, and diamond necklaces. In the group cover, Elsesser sports a metallic dress while Graham is lounging in a silver gown with a gray and white striped jacket placed over her shoulders. With the theme of “Body Revolution”, the shared cover also incorporates the fundamental mantra of Graham—#BeautyBeyondSize. In the interview, Graham emphasized how proliferating her message of beauty beyond size has always been preordained “destiny”. Her mother said that Graham is known to greet people when she was only three, and making them feel good is one of her traits. Therefore she would like to use that to let women know that they are beautiful and worthy. Elsesser too elaborated about her own personal journey towards self-love, saying that how she felt towards her body hasn’t changed throughout the years.